This special exhibition which attracted many visitors from far and wide was held in Mansfield Museum between October 4th – November 22nd 2014 . 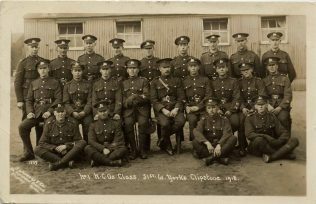 In May 1915 men of the UPS (University and Public Schools Brigade) of Kitchener’s New Army began arriving at a newly-built Military Training Camp at Clipstone. From small beginnings, the Clipstone Camp grew to become a massive concentration of wooden huts which, at its height, was home to 30,000 people – at a time when the population of Mansfield was only 37,000! Though many such camps were established, it is believed that the one at Clipstone was the largest in the entire country. It also served as one of the biggest Demob Centres at the end of the War. The exhibition, curated by local historian Pauline Marples, was the third in our trio marking the outbreak of hostilities 100 years ago. The camp’s story was be brought to life by photographs, documents, artefacts and the letters of some of the thousands of soldiers who were stationed there. On Tuesday 11 November as part of the commemoration of the War, the Museum held a ‘Clipstone Camp Remembrance Day Service’, led by Rev. Ann Anderson. Visitors and staff joined together for a short service to remember all those who lost their lives in WW1 and in all conflicts since. The service began at 10.45am and lasted for around 30 minutes, it was a very moving service made more so by the laying of poppies on photographs of war grave. Last Saturday, 4th October my husband and I went to the opening of this exhibition and can only say that if you don’t go to see it then you are missing something that is of great interest. 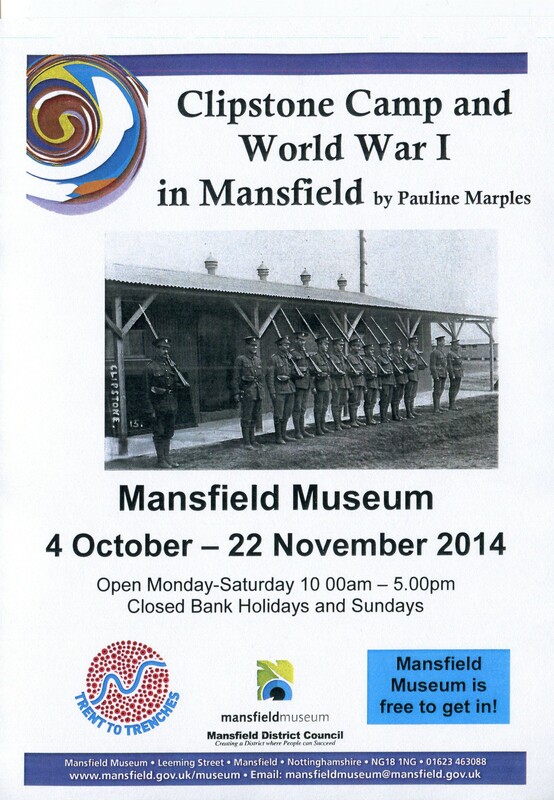 The research and hard work that has been put in by Pauline and Malcolm is phenomenal and adds to the interest and information shown in Pauline’s latest book ”Clipstone Camp and the Mansfield Area in World War 1″. 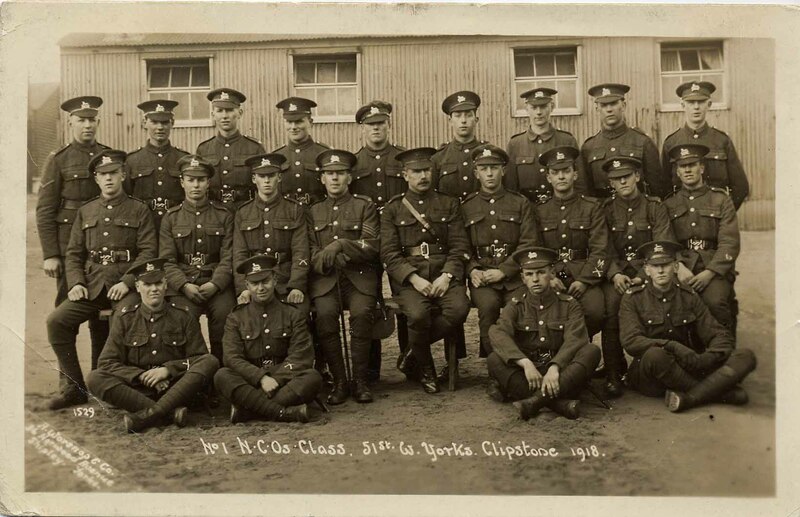 If you have a relative who was stationed at the camp then go and look at the many photographs of the different Corps. Besides the enormous reading matter and photographs, there are artefacts that have been discovered in the area which involved the campus from watch faces, pipe, personal effects, mouth organ to ink wells for writing letters home, bottles, badges, buttons etc. The whole exhibition is a record of important history for our area and how the people of Mansfield opened their homes and hearts to these lads, many of which were only teenagers and in their early twenties. Just see the ages inscribed on the gravestones, how heart-breaking for their families. Do take the opportunity to go to the exhibition while it is on and it is a good source of information for those who are researching their family history. We residents of Mansfield and area should be proud of our local museum and the new look for the entrance area depicting our many industries that have now disappeared is now on the way. That too is something to look forward to. P.S I’ve got to go again to take a second look at the exhibition as there’s so much to take in ! !